"Filament Stripping and Skipping" - This is an error mode in which the filament can either be stripped by the hobbed gear in the extruder or the extruder motor will "skip" while trying to extrude. If you encounter either of these issues, instructions below are provided for you to troubleshoot the issue. If you are unable to resolve and need help, then please reach out to us for further steps. Check to make sure the filament is not knotted or otherwise stuck in the filament tub. Check to make sure that you can manually push filament through the nozzle. In order to this it is necessary to heat the nozzle tip to the required temperature, and physically push the filament above the extruder downward. Generally it is necessary to depress the lever while pushing the filament. You should be able to get melted filament to come out of the nozzle. 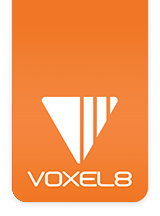 Are you using a material other than the PLA provided by Voxel8? Filament quality/diameter is variable across manufacturers and performance varies dramatically when comparing PLA to ABS to other more exotic FFF materials. IMPORTANT NOTE: We do not recommend using 3rd party filament with the Voxel8 Developer's Kit printer as it may cause issues. It is highly recommended that users stick with the Voxel8 PLA. Does the part you are printing have 100% infill? 100% infill can cause skipping or stripping, because in a 100% infill part it is more likely that the filament being extruded will have less space to spread into during extrusion, and thus there is more pressure on the filament, meaning the motor may not be able to drive the filament while it is undergoing greater pressure. Generally 100% infill should be avoided when possible. Has the part warped? Is it no longer connected to the bed? This follows from the previous note, in that a warped part may push up against the FFF nozzle, and thus prevent the melted filament from having a place to flow, which will cause an increase in filament pressure on the motor, which can lead to skipping or stripping. Do you have the correct tool offset for you FFF nozzle? If the FFF offset is incorrect and the nozzle is too close to the bed during printing of the first layer, then it is possible to cause stripping or skipping because once again the filament has no where to go. If skipping or stripping is only occurring during layers higher than the first layer, then it is unlikely that the FFF offset is the cause. Is the printer over-extruding? Over-extrusion can cause the same problem of higher filament pressure. To avoid over-extruding, try modifying the flowrate of the extruder using the Octoprint interface. Pull the filament out of the hot end and check to see if there is a thicker blob or "head" at the tip of the filament. This blob can cause jams by getting stuck in the PTFE tube leading to the heat break in the hot end. Stripping occurs when the gear that drives the filament literally grinds the filament material away, resulting in loss of traction on the filament, filament "dust" or shavings getting lodged into the teeth of the hobbed gear that drives the filament, and a weak point in the filament which is likely to break during filament removal. This failure mode cannot be heard by the user, and often isn't obvious until it is too late to save the print, because once the filament has been stripped sufficiently it is impossible for the hobbed gear to get enough traction to continue to drive the filament into the hot end. Manually depress the tension lever, and gently pull up on the filament to remove it. Using a compressed air gun or canned air, blow out the filament dust from the hobbed gear. To do this, blow the air into the filament hole while running the extruder motor. After these steps are complete, try to re-insert the filament after clipping off the stripped portion. Skipping occurs when the motor cannot drive the filament, but lacks the power required to strip the filament. In general, skipping is a more desirable failure mode than stripping as it is sometimes possible to recover from a skipping failure without having a print fail. Extruder skipping has a characteristic clicking noise that is audible to those around the printer. Once an extruder skips, it is very likely that it will continue skipping, which can lead to a failed print. Do not cancel the print. Loosen the filament tube so that it is possible to directly grip the filament leading into the FFF Cartridge. Grip the filament and push downward. This will potentially allow the filament to move past the skipping point and be extruded as normal. Watch and listen for any more skipping, as it may happen again. If the printer is over-extruding, try decreasing the flow rate of the extruder in Octoprint.